The Dow Jones Transportation Average has recently triggered what market technicians call a moving average “death cross” event. A moving average death cross is when the shorter-term 50-day simple moving average crosses below its longer-term 200-day simple moving average. Based on historical data, however, the death cross is not likely to trigger much doom and gloom for broad-based equities over the intermediate-term time horizon. Looking at historical data going back to 1987, when the 50-day simple moving average crosses below the 200-day simple moving average on the Dow Jones Transportation Index, subsequent returns on the S&P 500 Index tended to be flat for approximately three months, then moved higher over the next nine months (see the chart below). Since 1987, there were 22 times this happened. 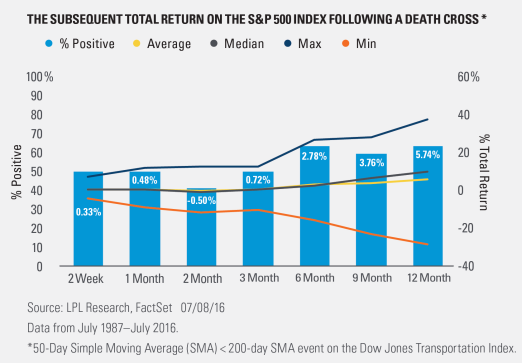 Three months later, the S&P 500 was higher 11/22 times (50% of the time) with an average return of 0.72% and a median return of 0.16%. Six months later, returns were higher 14/22 times (64% of the time) with an average return of 2.8% and a median return of 2.2%. Looking out over 12 months, the returns were higher 14/22 times (64% of the time) with an average return of 5.7% and a median return of 10.2%. Is a death cross event in the Dow Jones Transportation Index necessarily bad for the overall U.S. equity markets? No, not always; and in more cases than not, a death cross event on the Transportation Index results in the S&P 500 Index moving higher over the next 3–12 months and may present an opportunity to buy broad-based equities on a dip. The Dow Jones Transportation Index is the oldest stock index in the United States (first published in 1884), and is comprised of large, publicly traded transportation companies based in the U.S. It is price-weighted index and is currently owned by S&P Global.